Dead Animal Assembly Plant is a horror theatre-inspired collaboration of prominent industrial rock musicians. Expanding as an open collective, the Portland, Oregon quartet currently comprises vocalist Zach Wager, multi-instrumentalist Eric Bergen, guitarist Regulo Junior, and bassist Rebecca Cliborne. Stylistics considered, a factor of equal merit lies in their cyber butcher clothing aesthetic. Thus, the visual presentation aptly complements the sound. Vibrant color textures contrast with dingy, rough-hewn undertones, ultimately making the project compelling in the widest sense. 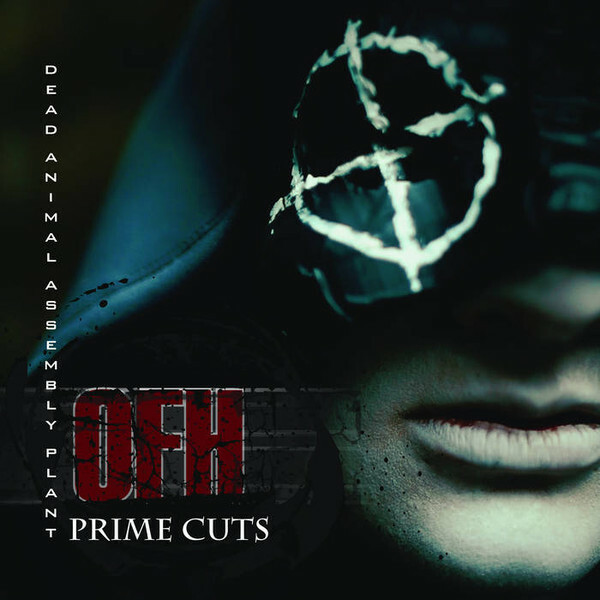 After a bittersweet outcome involving the album Old Fashion Hellfire not sounding up to par, the band released the cleverly titled, OFH: Prime Cuts. Essentially, five of the album’s choice tracks are upgraded—rearranged, remixed, and remastered—into a newly realized EP. For production, assistance came via two major talents – mixed by Marc Jordan (16volt, Escape the Fate, Die Antwoord, et al.) and mastered by Howie Weinberg (Nirvana, Smashing Pumpkins, Rammstein, et. al). The additional collaborative input is necessary by all accounts. Jordan and Weinberg clearly give professional treatment to these songs, but through a means that doesn’t sacrifice the band’s core authenticity. Before noting any of their stylistic happenings, though, a noticeable improvement in the EP stems from something crucial, yet largely overlooked—volume. The general volume is a considerably more comfortable level, and is balanced in such a way that no element seems overshadowed or cluttered. Further, there’s some focus on alternate arrangements, as well as giving the songs a more straightforward structure. I noticed improvement of pace in the lead track, “Old Fashion Hellfire.” The shortened transition between its sample and intro riff makes for better listening, as it makes a direct launch into the verses. As the song progresses, its guitar drive and vocal clarity are given prominence, while the industrial elements serve as both fills and backing textures. Given the implementation of these roles, its choruses become especially meatier and anthemic, and with just the necessary level of buildup. On the track to follow, “Rise with Me,” the implementation is subtle, yet still proves effective. For instance, the added samples in the breakdown at 2:05 (“It all has come to this, “A day of retribution,” “You’ll have my revenge”) provide context of Old Fashion Hellfire’s original perseverance theme. In combination with the sampled drums, the live takes give its rhythm a distinct, substantial intensity. “Six Feat Lower” seems to put slightly more emphasis on the guitar riffs, although the digi-drums work in conjunction with bolstering them. Around 2:15, there’s a much better mix, and subsequent interplay, within the screaming vocals and riffs. I appreciated how the vocals sat particularly well, and didn’t overpower the instrumentation like in the original. After that phase, the guitar solo has much more of a foreground presence, while the abrasive effects now trickle as a base for it. By the latter portion of the song, the vocal dynamics seem more appropriate in their loudened state, given the contrast between them and the progression of the instrumentation. As far as I could tell, the penultimate and final tracks, “I Will Suffer” and “Hopeless” stay relatively intact, save for a couple of differences: On the first track, the guitars do not repeat over the drum bed at 2:00, creating an interesting transition effect. Then, at the ending phase of “Hopeless,” a series of abrupt, harsh tones are replaced by one of subtle, subdued accentuations to the percussion. Overall, OFH: Prime Cuts proves exceptional enough to stand out on its own. Jordan and Weinberg’s production techniques on the EP come from not only working with a diverse alternative music clientele, but sharing a sincere affinity for eclectic and daring artistry. I’d consider this EP to encapsulate Old Fashion Hell in a nutshell. Rather than present itself as a mere hodgepodge of five arbitrary tracks, it maintains Dead Animal Assembly Plant’s stimulating foundation and thematic succinctness from start to finish.